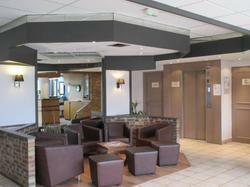 The Kyriad Fresnes is a comfortable and affordable hotel just 10 kilometres from Orly Airport. The RER B takes you to the heart of Paris in minutes. Staff at Kyriad Fresnes are welcoming and will offer good advice and directions for visiting Paris. Underground parking is available with an extra cost, while free public parking is possible outside the hotel. From Paris Porte d'Orléans : N20 to Antony as far as to the Croix de Berny, after on the left to Fresnes. From Versailles : Motorway A86 to Créteil, exit N186 Fresnes. From Créteil : Motorway A86 to Versailles, exit N186 Fresnes. From Lyon : Motorway A6 to Paris. After the running-track d'Orly follow to A6B Versailles. Fork to N186 Versailles, after exit N186 Fresnes. From Paris in RER or bus : RER ligne B 25 mn to Paris center (Châtelet-les Halles). Come down station Antony. Schuttle by bus 286, station Emile Zola or bus 287 from Porte d'Orléans, come down in station Emile Zola.